All Valpolicella wines (Valpolicella, Ripasso, Recioto and Amarone) are made with a blend of local grape varietals in different percentages. 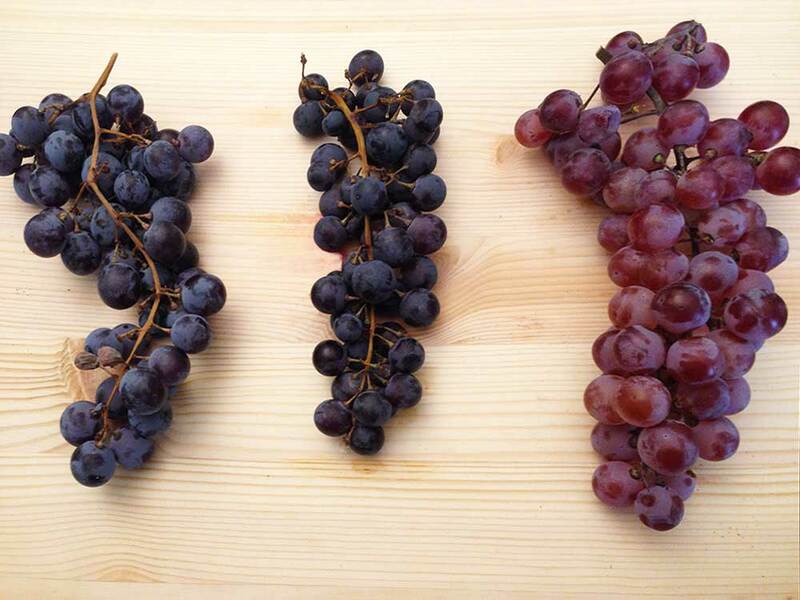 From left to right: Corvina, Rondinella, Molinara. Corvina has oval berries, Rondinella rounder ones, Molinara has a typical light color. This is the traditional Amarone blend, although Molinara is not mandatory since 2003. Since 2003 Amarone production regulations allow wine makers to use only Corvina and Rondinella although the traditional blend included also Molinara. Today it is still possible to use Molinara as well as other local grape varietals up to a total amount of 15%. 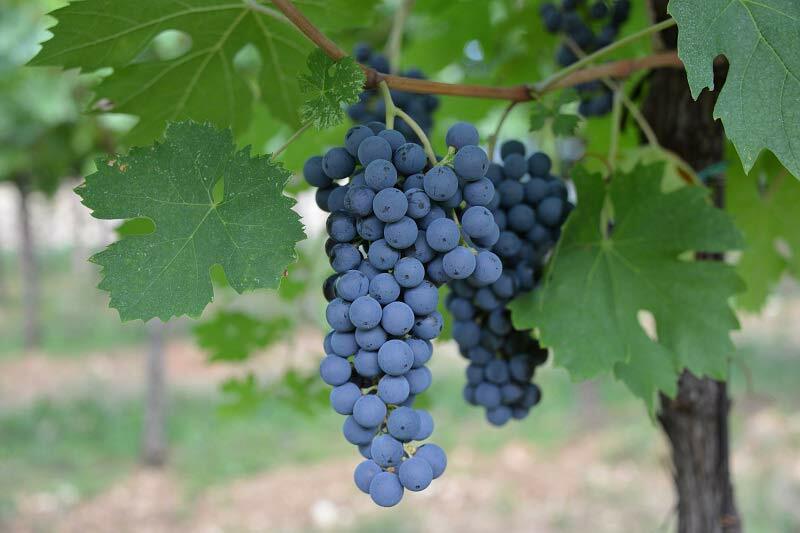 Typical grapes used in Valpolicella wines include Negrara, Oseleta, Croatina, ecc. Each grape add something to the unique taste of an Amarone. It’s the most important grape in the blend of all Valpolicella wines and Amarone. Depending on the wine maker, between 60 and 80% of the grape blend for the Amarone is made of Corvina which is also used 100% pure in few single grape varietal wines that are becoming more and more popular. 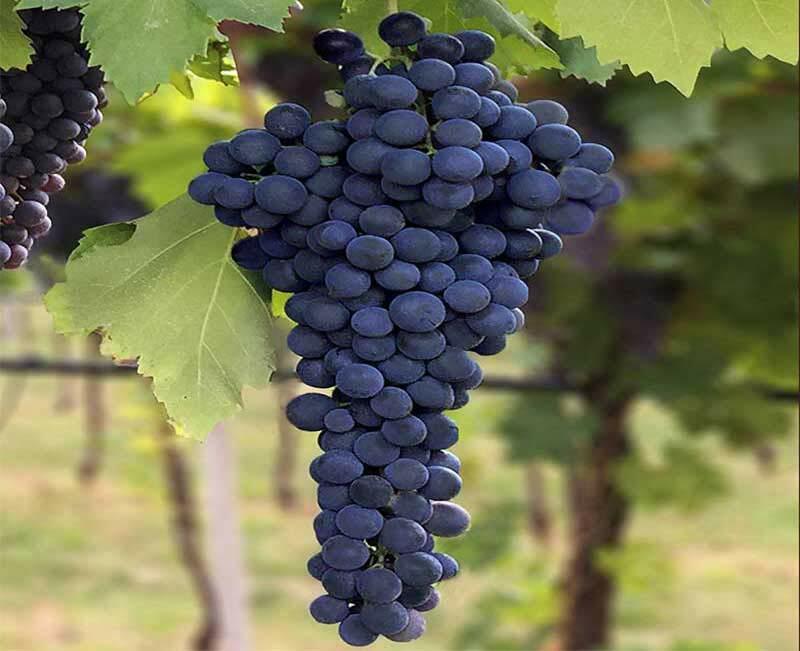 Corvina owe its name to the dark color of its bunches black as the feathers of a crow, ‘Corvo’ in Italian and can be easily recognised by the oval shape of its berries. Corvina is easily recognizable by the slightly oval berries. It’s the ‘back bone’ of Amarone and other Valpolicella wines, giving them structure and aromas. Corvina is a very special grape that gives its best only in Valpolicella. Few kilometers far from the Valpolicella Classica area, Corvina grapes are used for the Bardolino, a fresh and lighter wine, radically different from the Amarone. Other experiment to grow Corvina outside Valpolicella were unsuccessfull, proving how deeply rooted to the territory this grape varietal is. Corvina is a very complex and versatile grape. In spite of the powerful structure and the high sugar content it also gives very fresh and pleasant fruity flavours to the Amarone, especially cherry, plum and black curant. These flavours are extremely persistent even after a long barrel ageing, gradually evolving into even more complex tertiary flavours such as dried plum, cherry jam, etc. Recent studies on the DNA of Corvina grape, discovered a distant genetic relationship between Corvina and Pinot Noir. The study also discovered how, during the drying process typical of the making of the Amarone, the stress caused by dehydration activates portions of some genes of Corvina that develop unique flavours and aromas in the resulting wine. The same genetic string does not activate in Pinot Noir or in other grape varietals. This has been considered the proof of how Corvina evolved through the centuries adapting not only to a very specific territory, but also to the traditional wine making techniques of that territory: the Valpolicella. Because of this long presence of Corvina in Valpolicella, many different natural clones developed and today we can talk about Corvinas rather than a single Corvina. Corvinone, Corvina Rizza, etc. are some of these Corvina varietals, each with its own characteristics that need to be taken into consideration when deciding the result that the wine maker wants to obtain for an Amarone. Rondinella word means small swallow. The name of this Valpolicella grape varietal probably comes from the shape of its leaves that recalls the swallow tail. It easily grows all over the Valpolicella territory. It has dark colored, relatively small and round berries. Bunches are usually not too big and loosley packed which makes this Amarone grape varietal perfect for the drying process. Berries are round. 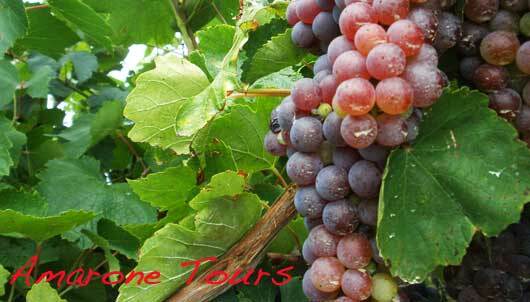 Rondinella grape represents 20-30% of the combination of grapes for Valpolicella and Amarone wines. Having a high sugar content it is often used in higher percentages in the making of the Recioto, the dessert wine produced in Valpolicella. It is a quite unpredictable varietals which is easily influenced by the terroir and by the specific vintage. It is the third traditional Valpolicella grape varietal which contributes to the blend of Valpolicella and Amarone wines only for 5-10%. It’s most evident characteristic is the light color even when fully ripe. Some producers make 100% Molinara wines that in spite of the long skin contact fermentation remain pink in color. The name means ‘miller’ in Veronese dialect and it’s due to the waxy surface of the berries skin that makes bunches look like they have been sprinkled with flour. It is an important grape in the blend of the Amarone, giving acidity and savoury to the wine. Unfortunately in recent years many producers started to reduce the percentage of Molinara in the grapes blend of the Amarone. The reason is that the light color of the Molinara transfers to the Amarone and producers are afraid that consumers might perceive this as a lack of quality in such an important wine as the Amarone. Moreover the most recent trends in the production of the Amarone tend to favour power rather than elegance, with darker, thicker and more concentrated wines in which the delicate Molinara can hardly found its place. With the latest change in the DOCG production rules for the Amarone released by the Valpolicella Consortium, wine makers are now allowed to relplace the 5-10% of Molinara with other grape varietals. Many producers decided to stick to tradition and continued to use it, sure that wine conoisseurs will understand and appreciate their choice. Others went for grapes with a darker color such as Sangiovese, Merlot, etc. even if a new rule change by the Consortium which is due soon, will probably limit to local varietals the choice for the remaining 5-10% in the blend of Valpolicella and Amarone blend. Besides Corvina, Rondinella and Molinara, there are other interesting grape varietals typical of Valpolicella. Some of them have they peculiar charcteristics that in recent years are being appreciated by those wine makers willing to experiment and to create wines with an original personality. Widely used in the extended Valpolicella area. Can be used with good results both fresh or dried. It can vary greatly, both in the production quantity and in the shape of the bunches, according to the specific terroir in which is grouwn. A light colored grape similar to Molinara. It is resistent to deseases but produce a small bunch. That is why it has almost been abandoned for the past fifty years when farmer focused more on the quantity of their production rather than on its quality. Many producers who want to redescover the tradition are now introducing it again. It has become quite popular in recent years. Pelara grapes, squeezed soon after harvest give a very fresh, light, almost aromatic wine with a very nice pink or light red color. Pelara is also excellent to dry because of its very loosely packed bunch. The name pelara, that could be tranlsated as ‘balding’, refers to the tendency of the bunch to loose part of its berries. It is probably the Valpolicella grape varietal that has become more popular in recent years. It had been almost completely abandoned and forgotten because of its small productivity. 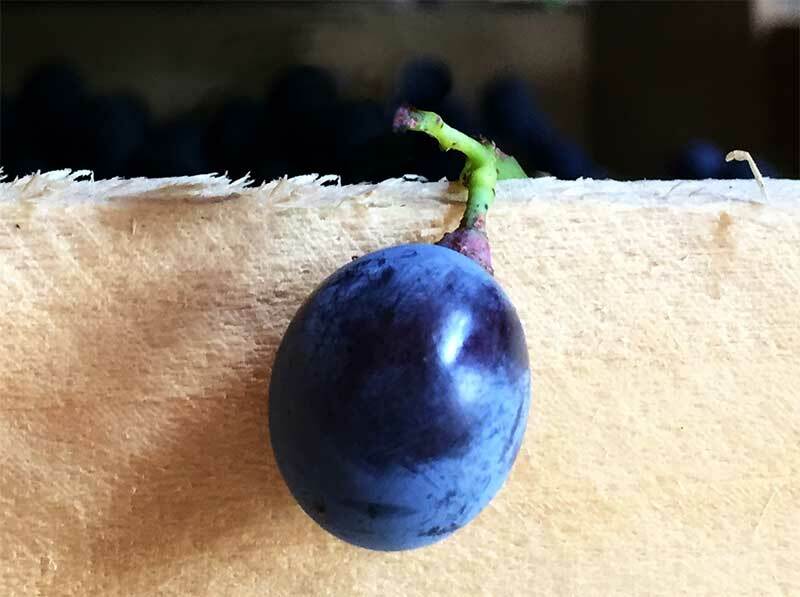 Oseletta is in fact caracterized by small bunches, small berries full of seeds and with a thick dark skin. In recent years, the pursue of darker, thicker and more concentrated Amarones has make many wine makers rediscovering again the Oseletta. The high tannin content gives the Amarone which includes the Oseletta in its blend a highly appreciated dry palate and a pleasently sharp tannic structure. Few Valpolicella wine makers are now experimenting 100% Oseletta wines whose tannins, after a long ageing in small French barriques, become extremely elegant.